Unfortunately, many meetings take place because of routine. Perhaps there has always been a Friday morning meeting, and always will be. That’s not a good enough reason to have a meeting, and there’s a good chance that many such meetings are rambling, boring, and accomplish nothing. Meetings don’t have to be a “necessary evil.” They can be useful, productive, and even enjoyable. Yet, meetings are sometimes necessary and can be the best way to communicate ideas and design strategies. How can you ensure that every team meeting is necessary, productive, and empowering? Here are six tips for making sure your team meetings are effective and accomplish what they’re meant to do. If your meeting doesn’t enable progress toward either a big, one-off decision or routine decisions that have significance, then maybe you shouldn’t have it. Every meeting should have a definable, measurable goal, which could be anything from determining which research will be submitted to a technical conference to short-listing venues for the annual holiday luncheon. Unfortunately, there are organizations where people attend as many meetings as possible in order to feel useful, to “gather intelligence,” or just to appear busier or more in-demand than they actually are. The people you invite to meetings should be invited based upon their role in making progress toward the goal of the meeting. Including unnecessary attendees rarely does anything except slow things down. When you distribute pertinent information to meeting attendees the day before the meeting, and that information reinforces the purpose of the meeting, you can make meetings shorter and more productive. There’s no reason to spend valuable meeting time having everyone read over test results or learn about information they could easily learn about on their own, beforehand. Make it a practice not to backtrack when someone shows up late to a meeting. If that someone is indispensable to the meeting, reschedule it. If they’re not, don’t “reward” them for being late by forcing everyone in the room to rehash information they have already covered. It’s rude and unfair to those who made the effort to be on time, and can throw off the whole pace of the meeting. Make it clear that you appreciate people showing up on time and participating. Technology can handle the task of crafting a team document. If your team still creates group documents around a table, the quality of those documents is probably mediocre at best, and you’re probably wasting several people’s time by doing it that way. Consider investing in training your team on using collaborative software and learning to use shared documents. It can save considerable time in the long run. If your meeting has a goal and doesn’t go off track, you should have something to report at the end of it. It doesn’t have to be an elaborate document, and it can be sent by email or even group chat. But you should document completion of your meeting’s goal in some form, both for future reference and to clarify what went on. For instance, “Joanna and Mike will write up the results of the engineering tolerance tests for submission to the annual conference. Carol, Jane, and David should forward their data spreadsheets to them before Friday” is both succinct and sufficient for your purposes. Team meetings are a fact of life, and when they have purpose and direction, they can be great for making progress. Unfortunately, many people equate simply having a meeting with making progress, and that’s not necessarily the case. Make sure each meeting has a goal, includes the appropriate people, makes background information available ahead of time, and documents the results, and you go a long way toward ensuring that meetings make a difference. If participants are assured that there will be no backing up and starting over for latecomers, and no excruciating “group writing” sessions, they’re more likely to look forward to meetings rather than dreading them. 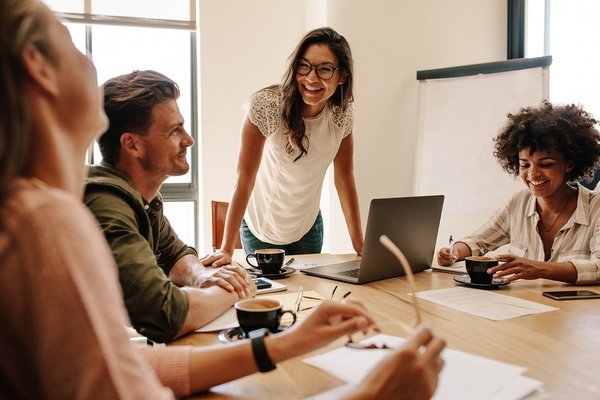 Meetings are one element in overall organizational culture, and getting them right is a positive step for everyone involved. I invite you to learn more about my corporate culture services because outstanding organizational culture is where innovation and accomplishment thrive.